Most Americans will experience a diagnostic error in their lifetime, according to a new report issued by the Institute of Medicine (IOM), a division of the National Academies of Sciences, Engineering, and Medicine. “Improving Diagnosis in Health Care,” the fourth installment in the Quality Chasm series, recommends specific strategies at every level of the health care system to prevent diagnostic errors. As internists, we enjoy well-earned status as medicine’s expert diagnosticians – so this report’s focus on misdiagnosis is particularly discomfiting. Yet chances are we can all recall situations in which we missed a diagnosis or when our clinical systems failed to deliver crucial information in a timely manner. In practice, we often don’t have reliable feedback loops to hone our judgments. For example, if a patient seeks a second opinion which leads to a different diagnosis than the one we offered, he or she is unlikely to follow up with us and let us know. Often, it is only when serious consequences occur that diagnostic errors come to light. The prevalence of diagnostic error is a profound statement about the challenge and importance of keeping current in medical knowledge. New diagnostic criteria for Alzheimer’s disease, for example, were developed less than five years ago. The IOM report suggests clinical decision support tools as a strategy to help address diagnostic error, but cautions that they are supplements to, not substitutes for, diagnostic precision. As noted in the report, studies have indicated that habitually relying on decision support tools may reduce independent judgment and critical thinking, and in certain cases, inaccurate advice from a decision support system has led clinicians to override their own correct decisions. As physicians, we share a commitment to staying current. However, we don’t know what we don’t know. The report cites studies indicating that clinical skills tend to decline over time, and that even experienced physicians do not reliably incorporate new evidence into clinical reasoning. Moreover, we are not good at self-assessing our knowledge gaps, and as the report notes, overconfident reliance on heuristics is one source of diagnostic error. The IOM report highlights the need for ongoing physician professional development and emphasizes the critical role of assessment processes, including Certification and Maintenance of Certification (MOC), as stimulators and feedback mechanisms to ensure that physicians maintain diagnostic competency throughout their careers. The report also recommends that certifying and accrediting bodies place more emphasis on the clinical skills that are protective against diagnostic error, including, most importantly, physician-patient communication and interprofessional teamwork. 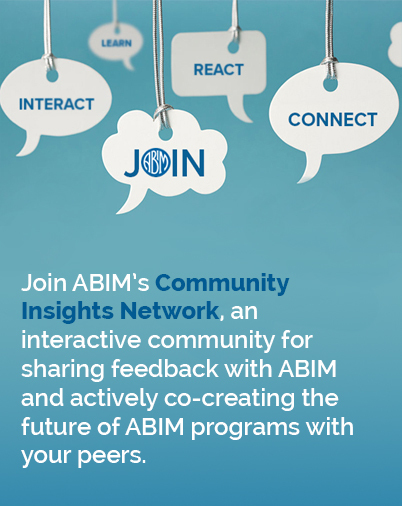 The purpose of ABIM cognitive assessments is to help maintain diagnostic skills through a rigorous, physician-developed evaluation of medical knowledge and clinical judgment. As the internal medicine community comes together to redesign MOC in ways that are relevant to physicians and protective of the public, we need to keep the IOM findings and recommendations in the forefront. I continue to welcome your thoughts at rbaronmd@abim.org.